Powderhorn Award - This program existed at Camp Kanesatake from 1926-1929 and preceded the Tipisa Honor Society which was created at Kanesatake in 1930. One outstanding Scout was awarded the leather patch per week of camp. There was a total of 24 awarded during those years and the one pictured is the only known surviving specimen. It is not known whether George Crossland, the council executive, brought the program with him from the Sturgis, Michigan Council when he arrived in October 1925 or if he created it once he got to the Wolverine Council in southeast Michigan. The requirements for the award are unknown. There is a surviving ceremonial vest with the Powderhorn Award beaded onto it that belonged to camp staff member from the 1920's. The program is believed to have been patterned after Dan Beard's "Buckskin Men" honor program that he used at his camps. The ceremonial vest is a gray fringed leather buckskin with painted images on it. 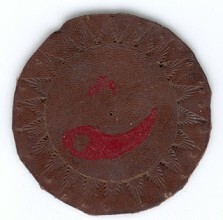 The 2" leather patch is brown with a red powderhorn painted on it with little tipis stamped around the edge. Tipisa was based upon the teachings of Ernest Thompson Seton.